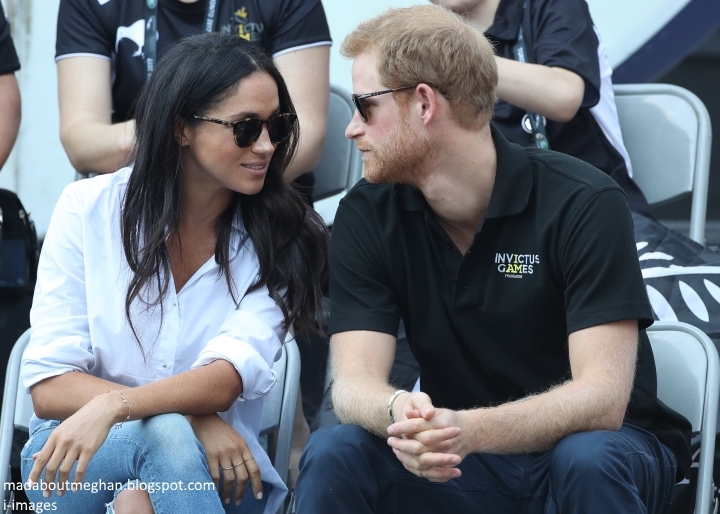 Mad About Meghan: An Invictus Engagement for Harry & Meghan, Military Support for Royal Wedding & Latest News! An Invictus Engagement for Harry & Meghan, Military Support for Royal Wedding & Latest News! Good evening! We're chatting about two new updates from the Palace, latest news and fashion items of interest. 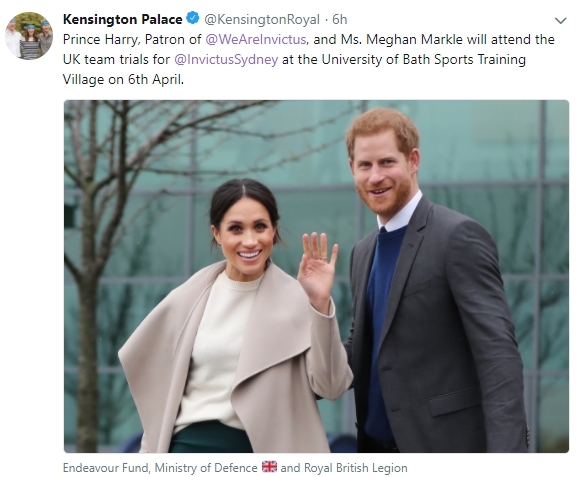 Harry and Meghan's Invictus Engagement... On Friday, 6 April, Prince Harry and Meghan will attend the UK team trials for the Invictus Games Sydney 2018 at the University of Bath Sports Training Village. The UK team trials are being run by Help for Heroes, with support from the Ministry of Defence, the Royal British Legion and the Endeavour Fund, and will be hosted at the University of Bath over four days. They will see more than 400 WIS military personnel and veterans compete for one of the 72 places available on the UK team. The couple will join Invictus Games hopefuls as they try out on the athletics track and field, before meeting those taking part in the indoor sitting volleyball trials. This is a very interesting engagement as Harry and Meghan will attend the Invictus Games in Sydney in October. According to The Sunday Times, plans are in the works for the games to coincide with a tour of Australia and New Zealand. The 2017 Invictus Games in Toronto marked the couple's first official public appearances. Just two months later their engagement was announced. Armed Forces to Provide Ceremonial Support for Royal Wedding... Kensington Palace tweeted earlier today: "The Ministry of Defence has confirmed that Armed Forces units with a special connection to Prince Harry will provide ceremonial support at his wedding to Ms. Meghan Markle on 19 May. Prince Harry and Ms. Markle are pleased that members of the Armed Forces will play such a special role in their Wedding. The Military, and these units in particular, hold a great significance for Prince Harry and the couple are incredibly grateful for their support." The Household Cavalry will "form a staircase party at St George's chapel". The military has played an incredibly important role in Harry's life and it's wonderful the connection will be celebrated at the royal wedding. 'Regiments and units that hold a special relationship with Prince Harry will provide ceremonial support at the wedding and during the carriage procession at the request of Kensington Palace. More than 250 members of the Armed Forces will perform ceremonial duties at the wedding. Royal Navy Small Ships and Diving. Prince Harry is Commodore-in-Chief, Small Ships and Diving. Royal Marines. Prince Harry is Captain General Royal Marines, after succeeding the Duke of Edinburgh in the role in December 2017. 3 Regiment Army Air Corps. Prince Harry served in Helmand Province, Afghanistan with 662 Squadron, 3 Regiment Army Air Corps. The Royal Gurkha Rifles. 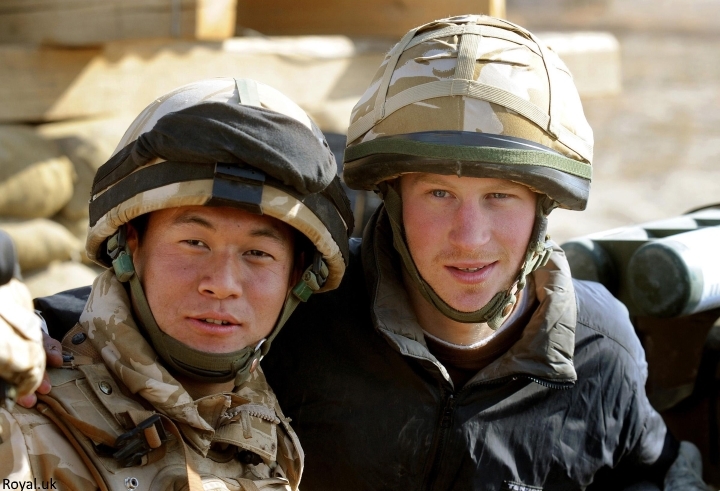 Prince Harry served with the 1st Battalion The Royal Gurkha Rifles in Afghanistan in 2007. RAF Honington. 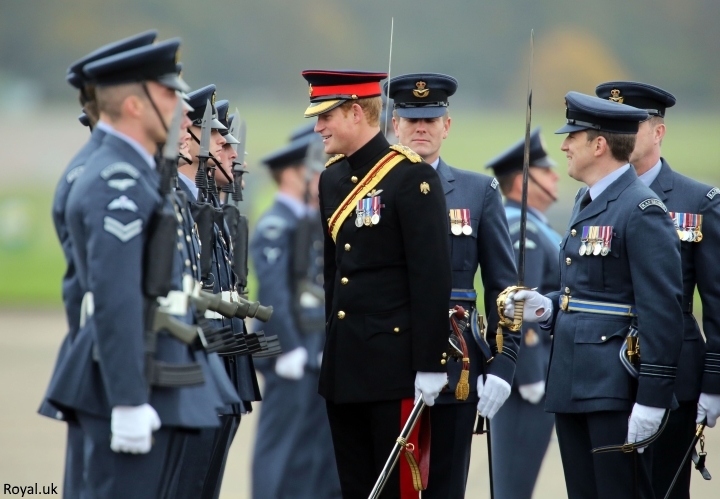 Prince Harry is Honorary Air Commandant of RAF Honington. The British Army shared this video following the news. An Official Visit to the Republic of Ireland... Harry and Meghan have not even tied the knot yet and we're already looking ahead to what their first months as a married couple hold for them. 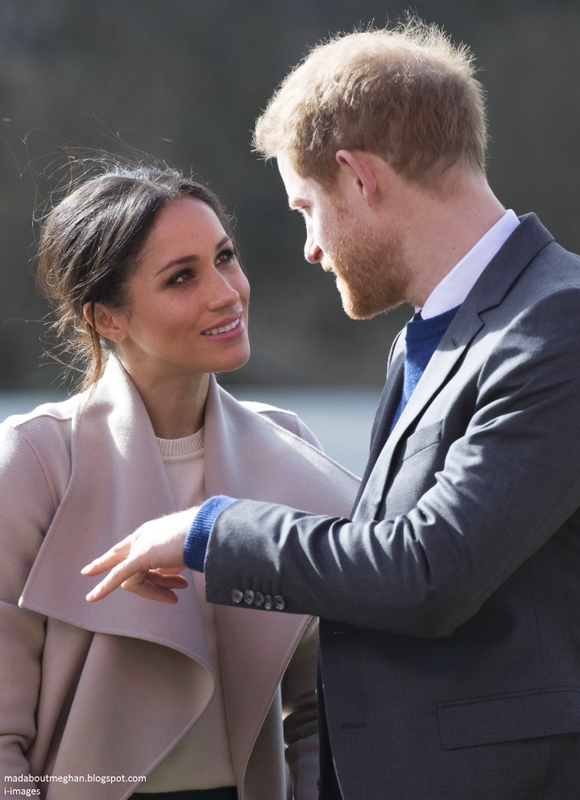 According to several reports the couple will officially visit the Republic of Ireland in the weeks after their wedding for two days. 'Sources tell the Irish Independent that they are likely to take part in a series of engagements over two days. It will be the second royal visit of the summer, as Harry's father Prince Charles, and his wife Camilla, are expected in late April or early May. "It will possibly be the first foreign trip after their wedding," said a source. The publicity around such a visit could prove helpful in Anglo-Irish relations at a time when Brexit has created a strain between the two governments. The British Embassy was not in a position to comment last night. 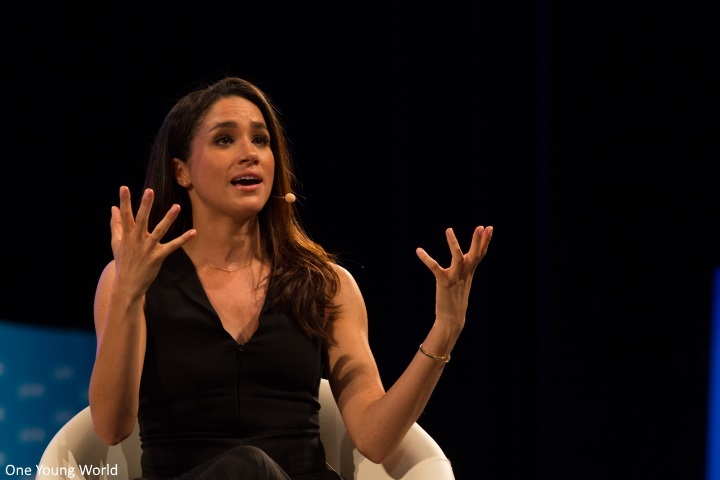 Below, Meghan at the One Young World summit in Dublin in 2014. You can read more about her work with the organisation here. There's a fun video from her Dublin visit showing Meghan learning to pull the perfect pint of Guinness. Meghan also discusses her father's Irish roots and working with Jennifer Aniston and Colin Farrell. Very excited for the trip and looking forward to seeing the itinerary! Fashion Updates... Firstly, we have an updated ID to share. 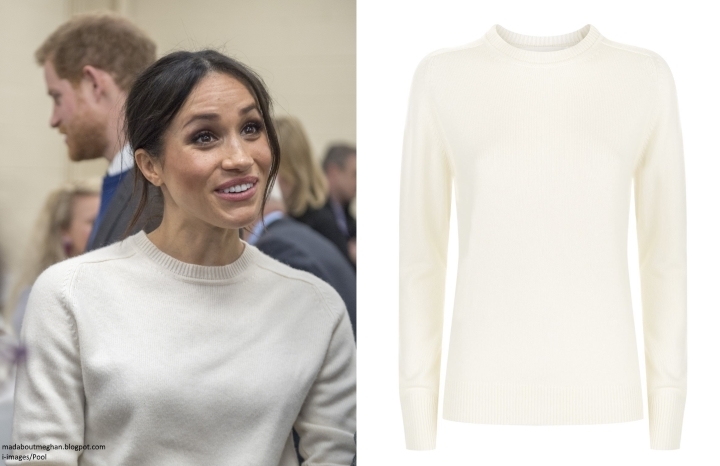 The terrific ladies at What Meghan Wore discovered Meghan's Victoria Beckham Cashmere Sweater is in fact a new season style and not an older piece as originally thought. The ivory sweater is available at Harrods. 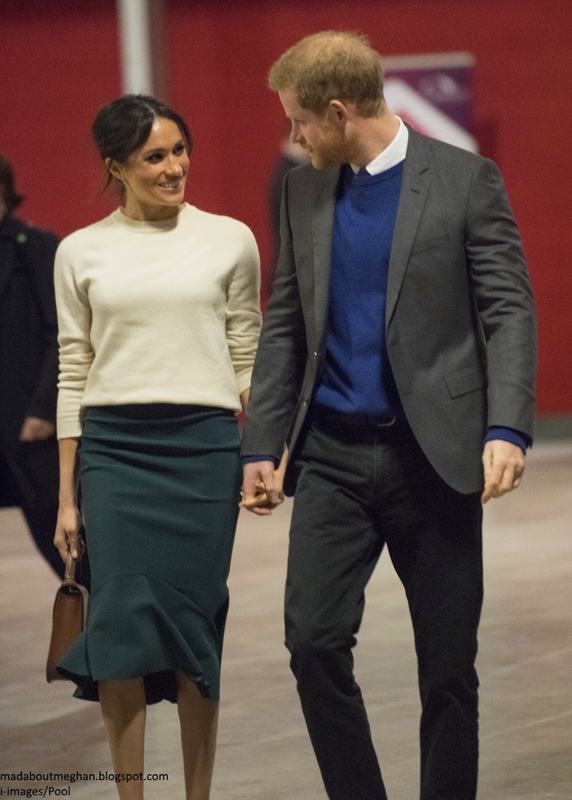 The Greta Constantine Kace skirt Meghan wore in Belfast is available for pre-order at Tres Chic (with thanks to Japanese Ginger). 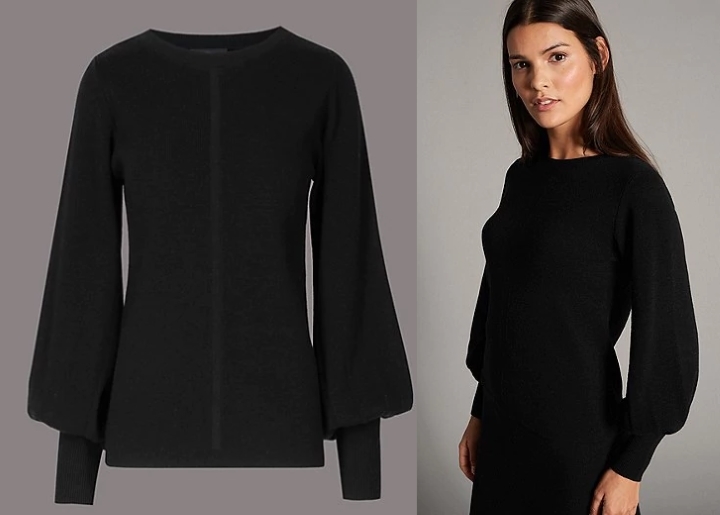 Meghan's Amanda Wakeley Springsteen dress is back in stock. 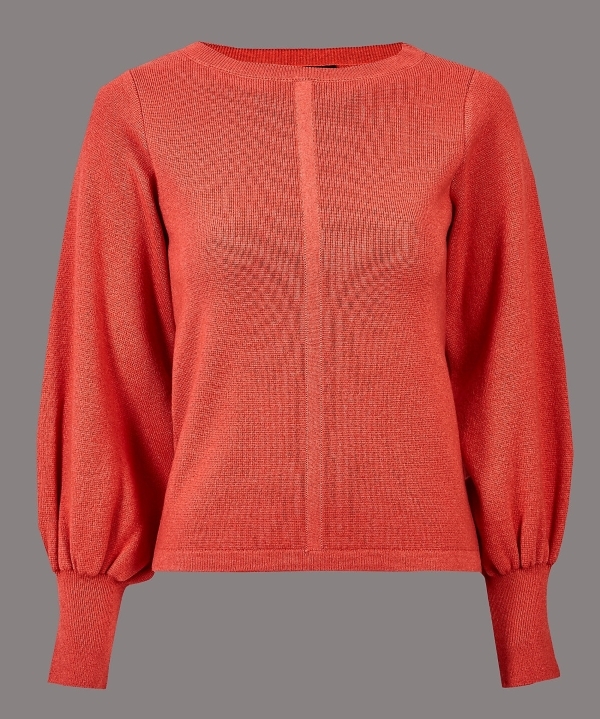 And Meghan's Marks & Spencer Autograph Wool Blend Round Neck Bell Sleeve Jumper has been restocked in all sizes again. It's also available in the striking 'Flame' colourway. Easter Sunday Appearance?... 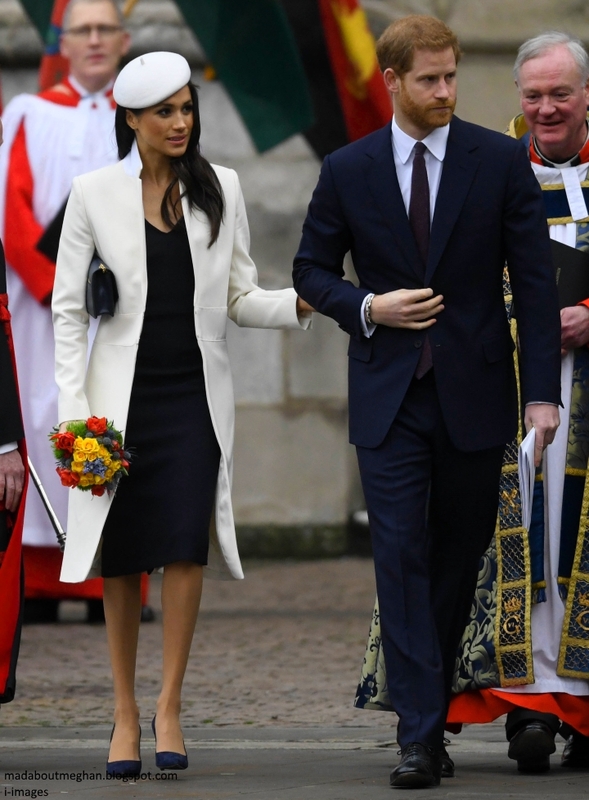 Several of you have been in touch asking if there's a possibility we'll see Harry and Meghan with members of the Royal family for Easter Sunday service. The service is held at St George's Chapel, Windsor where Harry and Meghan will marry in May. There's no official word nor has it been discussed by royal reporters on social media. It's also possible Harry and Meghan may have other plans, however I certainly wouldn't rule it out. We'll wait and see... Do you remember last Easter weekend Harry dashed to Canada to visit Meghan? The wedding is near and almost every day we know something new about the big day!! The army is very important for Harry,"the prince soldier"-not a surprise (for me)it will provide ceremonial support at his wedding. About the jumper,I don't like the red one,the black is very cool! As for the Easter Sunday service,I am waiting to see Harry and Meghan-why not? Didn't they just get back from Ireland?? Why does the article say that Harry has never been?? @anon — Northern Ireland (where they just visited) and the Republic of Ireland (where Meghan pulls the Guinness in the video above) are two different countries. Northern Ireland is part of the U.K. and Republic of Ireland is not. They recently were in Belfast, which is in the province of Ulster, or Northern Ireland. Now they may be going to the free state, or the Republic of Ireland. Although adjacent, these are two separate countries. Northern Ireland is part of Great Britain and the Republic has its independence from Britain. This would be Harry's first visit to the Republic of Ireland. They just returned from a visit to Northern Ireland which is part of the UK. The planned visit is to the Republic of Ireland which is a separate country. You should definitely find a book on Irish history. It'll blow your mind. I didn't know even 5% of the story until I went there last year and dove into it. Charlotte, I absolutely love this Post! :) So much to unpack! But first, did anyone else notice the news that Charles & Camilla will visit Ireland in "Late April" or "Early May"???? The Early May would tell me they want to get it in before H&M's Wedding, but The Late April adds to the hunch that W&K's Baby#3 may be arriving in the Early 1/2 of April!!!!! Thoughts? Well, a flight from London to Dublin takes just over an hour. So Charles and Camilla will be able to return home very quickly. Besides, in the past, I don't think they saw the Cambridge babies the day they were born. So there is no immediate need to be right in London when baby #3 arrives. They might not plan an extensive trip to Australia around the time of the birth. But a short trip to Ireland is easy to come and go. Charles & Camilla will be in Australia next week for the opening of the Commonwealth Games, at the Gold Coast (where I live). Hopefully the baby will wait until they are back in the UK. C & C actually will be in Australia this week! For the opening of the Commonwealth Games at the Gold Coast (where I am from). Becca, I don't believe that the birth of a baby would be a hiccup in a royal schedule ( other than the parents-to-be that is!). And C&C only visited George in the hospital;not so with Charlotte, so I expect the same scenario this time. Charlotte was in hospital barely 8-9 hours, so really no need for anyone to visit. I actually found George being taken to hospital to see her was quite ridiculous and so obviously for the cameras as to be daft. George wasn't even 2 yet, he probably didn't even notice his mom was gone for a few hours. But then I don't like the British way of parading newly postpartum bleeding mothers in front of the world media, I much prefer the Swedish way of doing it. So do we think he will wear his most official Military Uniform from The Blues & Royals or The Royal Marines? Can we get a roundup of Harry's dress uniform options? That'd be fun! I think he looked great in the Blues and Royals uniform but I'm doubting he'd want to repeat it for another wedding when it's his own. The other options I've googled haven't looked as good as that one did though, so who knows! On the day of the wedding the Duke of Edinburgh wore a uniform of a lieutenant in the Royal Navy. I also vote for a roundup of PH's possible wedding-day uniforms. That would be fun to talk about since it seems there may be some choice to the matter. "Normal" grooms are so boring! APOLOGIES! "Marines" and "Navy" are NOT the same! "Marine" is the exact word we use in Germany for "Navy" - and I was doing 10000 things at the same time while typing - so German and English got terribly confused in my lil´old brain, LOL!!!! So is the “staircase party” when the soldiers form an archway with their swords? Does anyone know? I googled the term but nothing came up (except pics of people partying on starircases, lol). If this is what it means, I think it will be lovely! I love that the military will be involved on such a big level. That must be so meaningful for Harry!! And I really love that he is continuing with his interest and support of service members and veterans. I love all of the fancy ceremonial uniforms so I’m sure they will all be a sight to behold on the wedding day. Which uniform do people think Harry will wear on the big day? I this he’ll wear the Blues and Royals uniform again. I hope the staircase party means a saber arch! Maybe Charlotte has a uniform poll planned. I hope so. That would be fun. Not sure what is happening on the staircase, but usually when the military forms an arch with their swords, it is called, A Guard of Honour. 🌸 Just a guess, but I think that that is what that means. 🌸 I ooked that up and all I found was that “The Guard of Honor” isn’t usually an arch per se (but what does wikipedia know, lol). “The Guard of Honor” that often just presents itself in sime formation, can at times, do a “Saber Arch” and I think that that sounds like what we are hoping for. I could find nada about “a military staircase party”. Town and Country, who had that phrase in their article, could have been a little more descriptive, lol. Whoa!! Vogue is reporting that Kensington Palace is Officially Gifting Meghan an Official Coat of Arms!! Yay!!! :) However, I don't know how people will feel about the next part? Evidently, just like with The Middletons, This Coat of Arms will be given to The Markle Family! Thereby enabling Any Markle Family Descendant forthwith, to have it to use! So there it is! @becca — I can’t imagine the coat of arms will go to Tom Markle Sr. If it did then his other children will be allowed use of it (just like James and pippa) and I just can’t imagine that after all of the spilling of family drama and trash talking about Meghan specifically that the BRF or the agency that grants the arms will want that. I mean, imagine what the half sister and brother might slap the coat of arms on!! I could imagine them selling things with the coat of arms etc. and that might make it seem like Meghan had enforced the product or something. Seems like it would end up being a nightmare!! I think the coat of arms will just be granted to Meghan alone. It seems like this is what was done for the current Duchess of Gloucester so there is prescedent for it to be created and given directly to a woman marrying into the BRF. Love your sense of humour, Becca, about the Thingy and Party bit. Scary thought that the Markle's will be able to use the Coat of Arms, but really, they live in the USA. I don't see much opportunity to flaunt it in the States. Actually, even in Britain, other than on stationary and royal thingys, how often do we see it? inthekitchen, you raised some good points. I suspect you are correct that it will go only to Meghan. I also do not think based on what we have seen that Meghann's Father or Mother would care at all about having a coat of arms themselves. Will be interesting to see how it is all handled. 🌸 Team “EAB”, lol. cute. Count me in. ✋ (that’s a high five). Again the ever charming Meghan Markle as evidenced on the video. I am amazed at her, and her number of engagements so far. She really let those boots running. I look forward to the Easter service and it will be pretty interesting to see how this couple gonna handle future holidays as the bride has no family in GB. I am very curious how much time they gonna spend with the royal family, with C&C etc. And how much they are willing to share with us. They provided plenty of details about the wedding so far, and seems to be at ease with that. Fingers crossed they keep this attitude, it would be so great!! @anett — I agree about the number of engagements so far for Meghan. I have been very impressed with not only the number but also the length spent at each (not just an hour or so) and the variety but also the consistency, if that makes sense? They have all pretty much focused on youth and improving the lives of youth in some way (if I’m not mistaken). And now Invictus, yay!! I do hope Meghan will add a charity focusing on veterans families to her portfolio (or whatever the correct term is there). I also like that we have heard that she’s been busy behind the scenes, not only having meetings with charities but visiting charities privately!! I really do appreciate that she’s a woman who’s had a career and sees the importance and value of work... and for her new role, the value of serving others. I cannot wait to find out which charities she will become patron of. So exciting. And hopefully she will have her initial list ready to go and announce it right after the wedding. As for Easter I really hope we will see her and Harry going to the service with the queen. And I’d love to see her in an easter hat. Apparently Harry himself is quite religious but usually celebrates with Charles and Camilla...but I think it would be nice for them to be seen going to church with the queen especially so soon after Meghan’s confirmation. Only a few more days and we’ll find out...can’t wait! As a person with an intense filming schedule involving long hours on set in addition to the various humanitarian programs Meghan offered hands-on support, I'm not surprised to see her plunge in. I know some have found it too much too soon (and there was some censure on DKB referencing Athena sprung from the head of Zeus instead of her taking her sweet time to learn the ropes). However, as an mature, ambitious, active, involved and committed person I doubt that a slow simmer start would be appropriate. The approach Meghan and Harry have taken has been proactive and established connection to the united kingdoms, various organizations and the royal family. Yes, there will be numerous things she needs to learn and likely a few missteps along the way. Who hasn't been in that position or occasionally put a foot wrong when changing jobs? It's a normal part of the process. What is not normal is having any and every little thing exposed globally and diced to death by people. Fortunately, both Meghan and Harry see the need to get on with their jobs and consider the rest as "noise." I hope we'll be as wowed as the reporters said we will, Anett! If she's been meeting people getting ready I suspect she'll be out of the gate quickly, and maybe on her own quickly too. Really looking forward to what the future holds, even if it is a little baby Meghan or Harry! Meghan wants to serve and she will be a patron of charities concerning young people for sure.I am waiting to see her working very often,perhaps Princess Anne and HM are their models! Wouldn't it be lovely for Meghan's mom to attend Easter services at Windsor? I suspect she'll never be interested in publicity, but it would be a nice introduction before the wedding. I have such respect for her--she's reared an amazing woman in Meghan. 🌸 That would be so sweet, Ms. Cuppa. Like Meghan I followed my husband in his country I am very happy but all my parents are away,so the presence of her mum would be perfect!It seems impossible to me,though I don't think she will attend. 🌸 Again. :) I think Doria will relocate to help Meghan with the babies and to be near as her grandchildren grow up. Meghan and her mom are very close. I really don’t she’ll stay miles and miles away in Los Angeles. Plus, she spent lots of time with Meghan with Harry. So it kind of fits that she’ll soon be jaunting about London and also their country manor. I doubt that she will actually live with them but she’ll be close. I do not think Doria will relocate and I do not think she will attend Easter Services. Suspect she will arrive a few days before the wedding and meet people then. I have no idea how close Meghan and her Mother are but her Mother appears to have her own very established independent life in the states and I do not think she will move. Many a family visits long distance. Meghan will not need any help with babies, I suspect they will have a nanny hired and ready to help from the beginning. Doubt it. Harry and Meghan will be busy and Doria has her own life and career in LA, she didn’t move to Canada when Meghan was there. As close as she is with her daughter she can FaceTime her and visit like a lot of other parents who have children that leave in another country. i imagine that Doria indeed has her own life established in LA, but security may continue to become such an issue that she finds it hard to continue her life s she knows it. And I would think that the allure of your only child's children would be quite a tug. Settling in London would give her the chance to continue her life and help others. What an adorable video of her pulling the perfect pint. She’s so engaging and diplomatic and charismatic!! I cannot wait to see her out on solo engagements! Also interesting about her having Irish ancestors...I wonder if they will visit the area where her dad’s relatives come from. A professional Irish genealogist has traced Meghan's ancestry to a Co. Galway woman called Mary McCague who married an English soldier named Thomas Bird and went with him to Malta (she was probably disowned by her family for marrying an English army man). Mary McCague's birth record states: "Mary McCague born in Ballinasloe to William McCague and Brigid Galaher in October, 1829." The genealogist is trying to establish that the McCagues trace their roots to Irish royalty. Mary and Thomas Bird's daughter Mary is Meghan's great-great grandmother. I have not heard that Meghan has ever visited Galway. I think she had only a quick trip to Dublin. I find all this fascinating. Marci, genealogists are always trying to trace roots to royalty, aren't they? I tend to giggle at that--if my ancestors are related to royalty it will only be because of "noblesse oblige"--some obscure baron having his way with my peasant great great great great grandmother. I’m still not a big fan of Meghan yet so I don’t usually read this blog. But since Kate is on maternity leave, I have to get my fix somewhere lol! And the more I read Charlotte’s posts and the many informative comments that are shared here, the more I’m getting excited to see what Meghan’s wedding is going to look like. Very cool to see details of the wedding invitations. And also, everyone’s guesses as to what THE dress is going to look like—all I can say is I haven’t seen a bad idea yet! I will have to start participating here as well so I can enjoy the upcoming events with you all! Haha thanks Becca! I always read Charlotte’s Kate blog and occasionally comment there but I don’t want to be left out of the excitement of a royal wedding! 🌸 welcome to the wedding excitement, Natalie. Can we conclude that the announcement of the ceremonial involvement of the military means that Harry will be in uniform on his wedding day? I'm thinking as Captain General of the Marines because that is his current position and highest rank, and since he is no longer a serving officer in Blues and Royals he would not be in the uniform of his former regiment. Definitely a uniform!👍 I'm also thinking that if the weather cooperates, Harry will walk to the chapel with William. On Prince Edward's wedding day, he was accompanied by Charles and Andrew as they made their way down to St George's Chapel. Hmm, that said..... I wonder what William will wear? Uniform? If so, which one? Morning Coat? What do you all think? Zora, unless it rains, I do believe we will see H&W walking together as they enjoy their own private thoughts, both happy and bittersweet. I am loving it that the member of military units important to Harry will line the streets of Windsor; does this mean there would be less of a need for police? AG, I love it too & was wondering the same thing? I don't believe so. I think the military will be there in a more ceremonial capacity and not for the purpose of providing security and acting as law enforcement. that she has Irish ancestors AND that she is aware of it. And, that would be so fun to have Harry with her as she visits the places of her ancestors. She could take photos and send them to her dad. 🌸 Becca. I guess somewhere pigs are flying, lol. Someone is asking me for I.T. tips. My family would be howling, lol. I tried to post earlier but it seems not to have worked...anyway, love your blogs, Charlotte! They are my go to sources for all things Kate and Meghan! I am very excited about Harry and Meghan's visit to Bath as it's fairly near to where I live. I was wondering your thoughts on if there will be a walk about like on the previous visits they have been doing? I was told it was a private visit and there wouldn't be a chance for the public to see them. Do you think this would be right for this engagement? My aunt and I would love to catch even a glimpse especially as they are so near...what do you think? Thanks!! Oh Anon 18:57, How exciting to have them coming so close to where you live! :) Oh I do so hope that you & your Aunt will be able to even just get a teeny weeny glimpse of them! :) Keep us posted? Thank you Charlotte, as always, for this very fun post. The Invictus Games seems like a it has the potential to become/is already becoming a very popular and meaningful “signature” engagement/cause for Harry and Meghan. It will be fantastic to see them at the Games in Australia when they are newly married. I read an article in the Times suggesting they are going to Namibia for their honeymoon. Have you heard anything about that, Charlotte? It sounds like a wonderful trip, if true. Christen, you are so right! Seeing them at The Australian Invictus games & then a possible attached Tour of Australia & New Zealand afterwards would be So Great! :) I think we have lots of fun experiences to look forward to with them! :) I heard Namibia too, but I'm wondering if they will go somewhere secret? “engaging, (very) diplomatic, and charismatic” and obviously loves being interviewed and participating. Julia Roberts mannerisms there once in a while also. Meghan said, somewhat longingly, when she was doing “Suits” and was talking about her ambassador travels that she was surprised because she thought somehow that she would still be doing “political things”. Not to worry. Meghan has her dream job now. She can and does approach it with aplomb, excitement and enthusiasm because she chose training for this very role. No hesitation, trepidation or wishing she could be doing something else. She loves, loves, loves it. The Prince, titles, castles, palaces, supreme cuisine and fine wines are just cherries on her sundae. Of all the Royals, no one probably actually enjoys the Royal duties more than Meghan. (Not saying others don’t, but...) To her it is probably not like she has to do them. Seemingly against all odds, she gets to do them. Who would have guessed? What actually are the odds? Anyone know? Your comments here are spot on SG. I am very much looking forward to what Meghan after marriage. 🌸 thanks, Bernadette. And I also am looking forward to that. Prayerfully as always. 🌸 What I don’t understand is why Meghan would receive a Bram Stoker award as he was an author of scary stories and the award usually goes to authors of scary stories. So why did Meghan get that particular award? 🌸 I am so, so hoping to see Prince Phillip at Harry and Meghan’s wedding and at Eugenie’s also. And at the baby christenings. It would mean so much to everyone if he can manage it. I'm a bit concerned about Prince Phillip, I was reading somewhere that he planned to attend the Maundy Thursday Service with the Queen, but wasn't well. Interesting stuff about Meghan's Irish roots! I remember reading an article somewhere about Meghan visiting Malta because she had some ancestors who had settled there. It may have been in conjunction with something else, perhaps in relation to wines and vineyards. Does that ring a bell with anyone? SG I was curious as well--how did she end up with a Bram Stoker medal? So I Google'd Meghan Markle and Bram Stoker and here is the answer https://www.irishcentral.com/opinion/others/how-prince-harry-s-fiancee-meghan-markle-charmed-us-in-dublin. Neat, eh? Thanks, Charlotte. You keep us ahead of the game. Looking forward to the wedding. Every little bit of news gets me more excited. Happy Easter to all of you. I wonder why so many details are being revealed ahead of the wedding. Was it like that with W&K? I dont remember. Seems a shame to spoil the surprises! Yes, it was this way with W&K also. Media hype maybe but I don't recall a promotional-type series of official press releases about details of William and Catherine's wedding. I honestly think the Commonwealth gathering in London the month before the H&M wedding has something to do with it. And tourism. Did some googling re Meghan and Maltese connections. She has an ancestress born in Malta. She did a trip to Malta for Elle UK. There are interviews and photos. Her ancestry just gets more and more interesting! Won't include links as some of them have cookies, but a quick google should bring up articles and photos. She is wearing an unstructured camel coat, jeans, and flats in several and totally rocking what we would now recognize as her "style." What a lovely update :) like everyone else it seems, I too was confused about what staircase party meant but I’ve now a clear picture in my head. We’ll see if reality lives up. 🌸 Cute interview alert. There’s a cute interview in the Daily Mail today with Joshua Silverstein, Meghan’s “first kiss”, she said. Joshua said that he and Meghan when they were about 12 were close friends and dated for quite awhile when both they and his family and Doria attended for years the Agape International Spiritual Center in Culver City. He says that Doria still attends there and that Meghan did also when she visited from Toronto. Joshua and Meghan attended their summer camp and did (surprise, surprise) a play that (surprise, surprise) Meghan put together, regarding teachings of the center that are based on the teachings of the founder Michael Bernard Beckwith and his founding thesis, “New Thought Ancient Wisdom”. Meghan is now on the cover of Tatler. Did she recently pose for that cover photo or is that an old photo? Old photo recycled and Meghan didn't give an interview. I would almost bank on Harry, Meghan, Kate, and William being at Easter this year with the Queen. The Queen reportedly instructed William to wear the uniform of Colonel of the Irish Regiment for his wedding. He put on his air force uniform for the drive from Buckingham Palace to Clarence House, with the rescue helicopter hovering overhead. I suspect she will want Harry to wear his Captain General of the Royal Marines uniform. Maybe he will find another a way to honor his own regiments, who will honor him. The chapel steps are high and wide, and the royal family stood on them to wave off Edward and Sophie, and Charles and Camilla, after their weddings. If there is to be a saber arch, I think it would be up at the chapel entrance. Can’t remember if there is a large enough flat platform there. Almost midnight here, might look at pictures tomorrow. I hope Prince Philip gets better,perhaps Prince Andrew will replace him,or Harry? Prince Andrew was there but went into the chapel before the Queen.